After the delights of pottering very slowly through the single track roads around Achiltibuei yesterday I don't want to go home. Nor do I want to return to the routine of just dragging through the countryside rather than actually poking my nose into the side roads and back lanes. Today is about transport. Come on Ren, be more positive. I am in my most favourite town and I have some seriously alluring roads to ride through, I ought to be thankful not resentful. Chin up boy and stop being a miserable git. I guess it's time to take the tents down and head south. So with the tent packed and the sun slowly making things warmer and more palatable I thank my host, the chap who organised this rally. "Was it worth the effort?" "Yes of course it was". If only he knew how much I enjoyed my solo ride yesterday, if only he knew how each time I come to Ullapool I fall in love with the place again. But he doesn't and the words in my head seem futile and gushing rather than a way of satisfactorily sharing an emotion. Language is frustratingly limited. Mark and I hit the road and roll out of town and onto the wilderness of the A835 towards Inverness. With brightening sunshine and my improved mindset it feels a lot less bleak and threatening today. The miles roll by as vast mountains and deep lochs slowly become rounded hills and agrarian fields. Empty stretches of high moor gently flow into farms and villages. Slowly but surely the level of traffic increases, this means we are returning to civilisation. While it no longer feels outlandish or remote The Muir of Ord and Beauly are charming towns resplendent in the September sun. When we drop steeply into Drumnadrochit I start to feel like I'm back in the Highlands again. 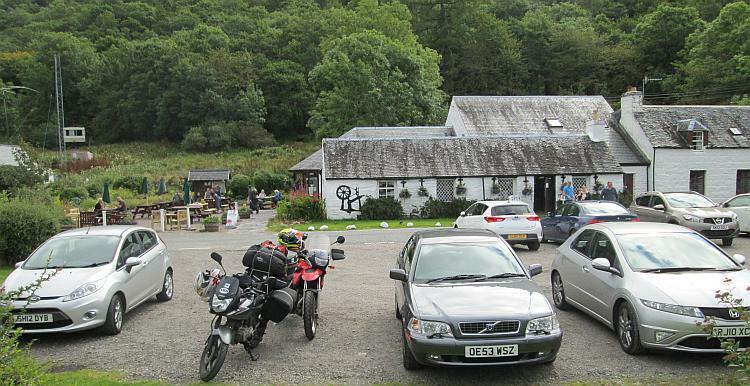 We take tea and a snack in a cafe then mount up once more to run alongside Loch Ness. Loch Ness, the famous Loch Ness, held aloft as the epitome of The Scottish Highlands and renown for it's beauty. Hmmmm. There are far far more impressive Lochs in Scotland in far more imposing surroundings and accessed via far quieter roadways. I guess Loch Ness is famous because it is beside the main road so lots of people see it. That and something to do with a monster that may or may not exist. Loch Ness is a marketing success. 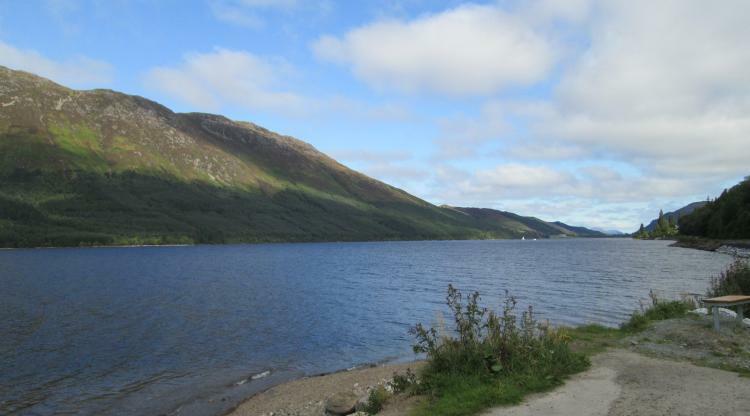 On the other hand Loch Lochy just down the road is a much finer example of what the Highlands can offer. "Loch Lochy" though, it's a bit like calling a brand of motorcycles "Bikey Bikes". Loch Lochy. Delightful but overshadowed by Loch Ness' fame. Mark's airbed has been leaving him feeling deflated so our next stop is Fort William. Luckily for Mark I was near here freezing my bits off this January when I suffered the same fate. I purchased a new airbed back then so I know where Mark will be able to purchase one now. I wait with the bikes in the car park and he returns with a new self inflating mattress. We hop back on the bikes and head south. As I ride out of the town the sun reflects on Loch Linnhe and I realise we've just covered 110 miles and I barely even feel like we've just set off. The miles are easy today. Just 15 miles down the road I stop at another familiar cafe for another cup of tea. This is Crafts And Things just outside of Glencoe village. Being at this café that I've been to several times before then later passing through the familiar valley of Glencoe itself raises a quandary for me to wrestle with as I head across Rannoch Moor. Do I really want to be an adventure traveller exploring the new and unfamiliar places or not? Refreshement at the familiar Crafts And Things near Glencoe. It is relaxing and comforting to know where the next good café will be. I am at ease because I know soon enough we’ll be at The Green Welly and I know what to expect there. I know I love riding around the Highlands. I feel safe and prepared here because I have been coming here for the last 10 or so years. Oh dear. I am within my comfort zone. The Highlands is within my comfort zone. I may not be on a crummy beach in a bland holiday resort sipping cheap foreign beer but I am doing things I feel safe and comfortable with. The Green Welly stops my thoughts before I end up stuck down the rabbit hole. I'm hardly exploring new territory on my motorcycle at The Green Welly am I. Discussing with Mark we both agree the travelling has been very easy today. It’s the middle of the afternoon, we’d planned to camp here but we both feel fresh and ready to carry on. After some umming and erring Mark agrees we should carry on to Callandar and to a campsite I know there. See – I've done it again, I'm not exploring I'm going somewhere familiar. Shut up Ren and just enjoy the day will you. By the time we get to Callandar my backside tells me it is time to stop. Even so the ride has been straightforward and enjoyable. I compare how I feel today having breezed through 200 miles of Highland wonder compared to how I felt after the same distance on Wednesday along motorways and ordinary "A" roads. Distance is measured in miles for sure but it is perceived in the mind and the body according to pleasure, engagement, conditions and mood. Clear skies and splendid roads lets the miles disappear like biscuits from my cupboard. 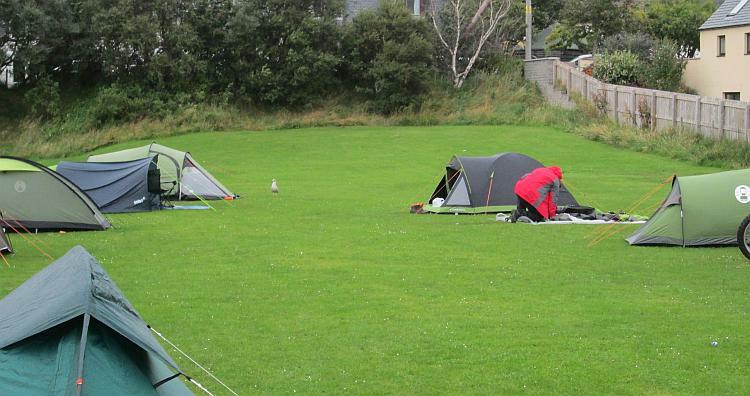 The campsite has had some improvements. I recall when the gf and I came here some years ago the reception was just a static caravan with a family in it. Now there's a smart house with a slick reception to the side, luckily the prices haven't risen exponentially to cover the cost. Next to reception there are some toilets, absolutely fabulous showers and then there's the washing up area. Unlike most campsites the boiler room has been configured to create a small but very warm drying room. If the weather had been against us this simple yet sensible service would have been overwhelmingly welcomed. I approve all around. Except the grass...the grass is still a bit unimpressive... I'm a fussy critic aren't I. Mark warms a tin of stew and I warm my tinned curry then we share out a large portion of boiled rice I've cooked to stodge it all out. We sit there in the setting sun just munching our meals and talking casually. It will be time for bed by the time I've washed up, had a shower, talked to the gf online and had a game or 2 of chess. It's not been a bad day at all this one. I...I do think I'm ready for a bit of home comforts soon though. As I settle in these thoughts keep me wondering if I'll ever be the wild adventurer or am I really just a home boy with a stupid dream.